Provide engaging practice to identify similes and metaphors. 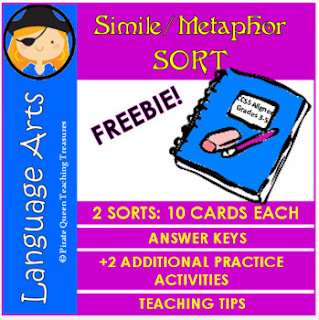 Two sorts are included with 10 Simile/Metaphor cards per sort along with answer keys and recording sheets. In addition, a follow up activity requires students to name the two compared items and to explain how they are similar. Also, students can create their own Simile/Metaphor sort. Here's a gem of a product for teaching Figurative Language! Sail to my store for more teaching treasures! Please provide feedback if you decide to download this product.